Learn how to change the oil on your 2016 Chevy Equinox with a Ecotec 2.4L I4. We've got a step by step how to with all the parts and tools you'll need. 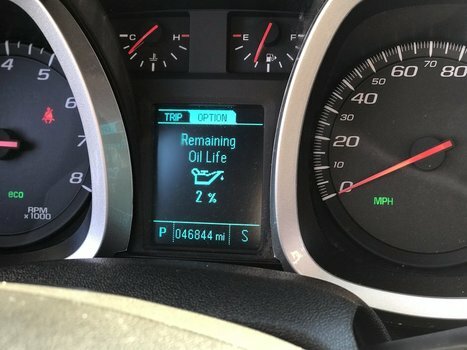 Chevrolet calls for an oil change every 7,500 miles under normal use. Optional - Replacement Fumoto Drain Valve - WORTH THE MONEY! 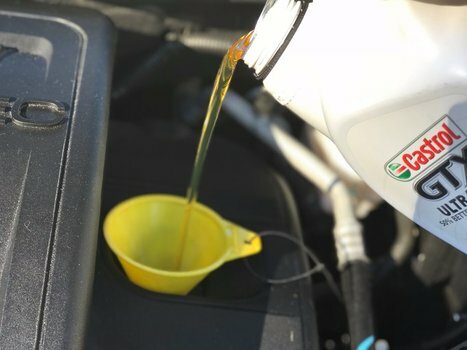 No more messes, quick and easy to drain oil! Lift the front of the vehicle using your jack and jack stands, or with ramps. Be careful and safe! SET YOUR PARKING BRAKE! Using a 15mm sized socket or wrench, loosen the oil pan drain plug. With the drain plug now loose, place your drain pan under the oil pan and remove the oil drain plug completely. Let oil drain completely. Once the oil has completely drained from the pan, reinsert and tighten the oil drain plug back into the pan being careful not to cross-thread the plug. 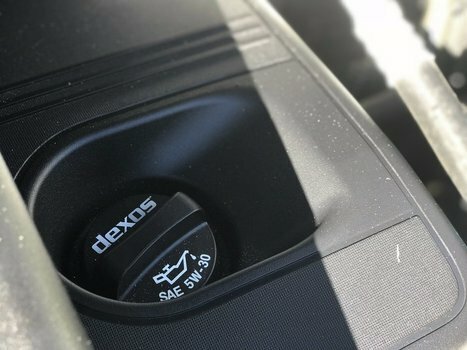 Chevy recommends about 18lb-ft of torque when tight....in other words, get it good and snug by hand, you DONT need to hammer down on it. Replace your stock drain plug with a Fomoto Quick Release Drain Valve. 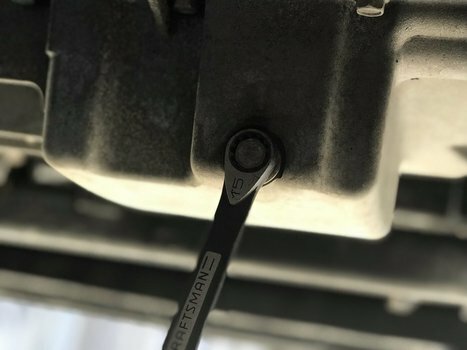 Makes oil changes that much simpler with less tools! 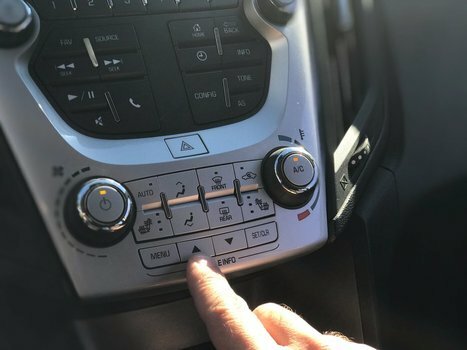 The Chevy Equinox uses a cartridge type filter. 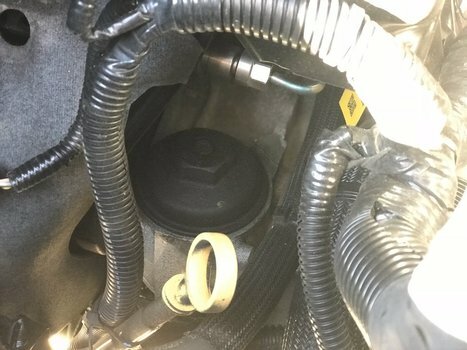 It is located about the middle of the engine bay, behind the oil level dip stick. Using a 1 1/4" or 32mm socket, loosen the black cover of the filter housing. With the oil filter cap loose, remove it. The oil filter is attached to it and will come out with the cap. Remove the old filter by pulling it straight off of the cap. Wipe down the cap of any residual oil. 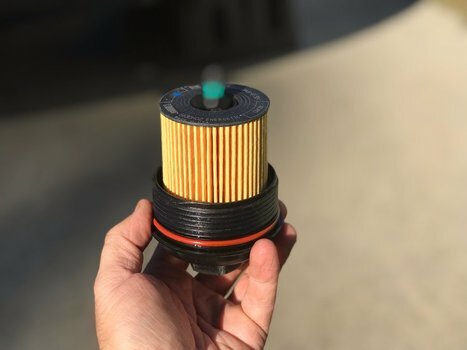 Install new oil filter by pushing it into the cap. It can only go one way. You should hear it snap into place. Also, be sure to change the rubber o-ring that is located at the base of the cap. 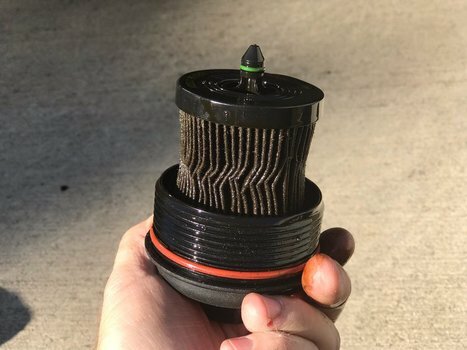 Your filter should have come with a new o-ring. Replace filter/cap by screw it back into place. Tighten until snug by hand first, then using your socket, give it another 1/4 turn. Do not overtighten. Remove the oil cap on the top of the engine. Place your funnel in the oil filler hole to avoid messes when pouring the new oil into the engine. Carefully pour in 5 quarts of your choice brand of 5w30 motor oil. The actual oil capacity is 4.7 quarts, but we promise that extra .3 quarts will NOT do any harm to your motor. 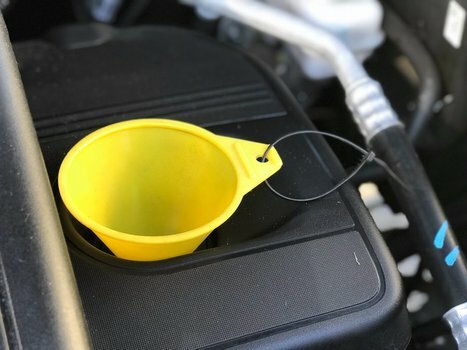 Once you have finished pouring in fresh oil, remove the funnel and replace the oil cap making sure to tighten it to snug. 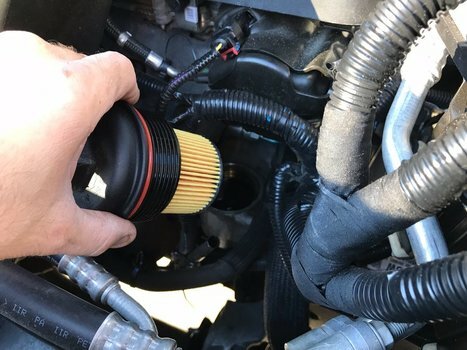 Take a moment to visually check for any leaks and to be sure you havent left any tools or foreign objects in your engine bay. 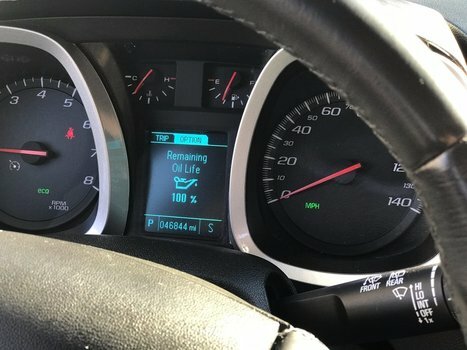 The Chevy Equinox features an oil life indicator on the dashboard telling you when it's time to change your oil. After you have changed your oil, you will need to reset it back to 100% so it can begin the cycle again. Follow this procedure to reset your oil service light. 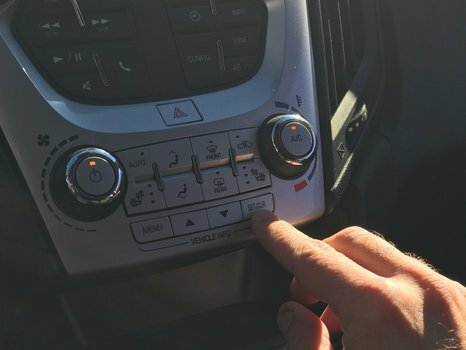 In the center of your dashboard, under the radio controls, hit the "MENU" button and "ARROW" buttons until you toggle to the "Remaining Oil Life" indicator on the gauge cluster. With the "Remaining Oil Life" displayed, hold the "SET/CLR" button for a few seconds. 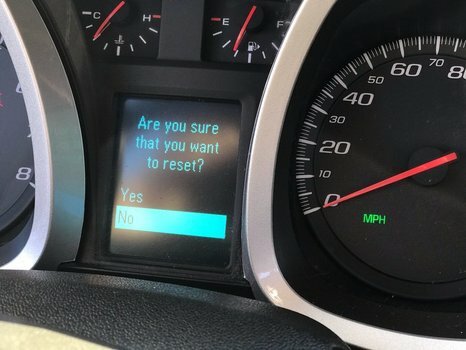 You will now see a new message asking if you are sure you want to reset. 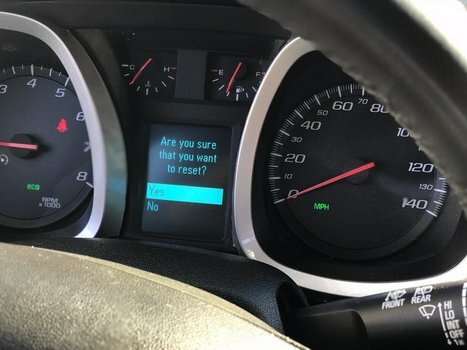 The default is "NO". You will need to change it to "YES". Hit the "UP" arrow to highlight "YES" on the display. You should now see "YES" highlighted on the display. With "YES" highlighted, hit the "SET/CLR" button once to complete the reset of the oil life indicator. You should now see "Remaining Oil Life 100%" on your display. You can now toggle the "MENU" button back to your preferred display information. 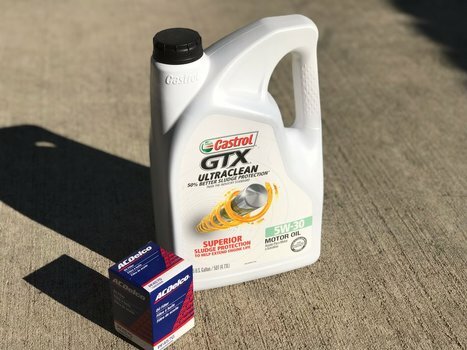 Your local auto parts store will take your old oil as long as you don't mix it with any other fluids. Thank you. Excellent video. Helped me immensely.